WASHINGTON -- This week, it was reported in the authoritative Capitol Hill newspaper, The Hill, that Don Van Natta Jr. and Jeff Gerth included some unsavory news about Sen. Hillary Rodham Clinton in "Her Way," their recent book about her. Hillary, during the 1992 presidential campaign, "listened to a secretly recorded audiotape of a phone conversation of Clinton critics." Washington observers appeared shocked. Mein Gott, where have they been all these years? The Clintons have engaged in brute behavior for decades, much of it a matter of record. 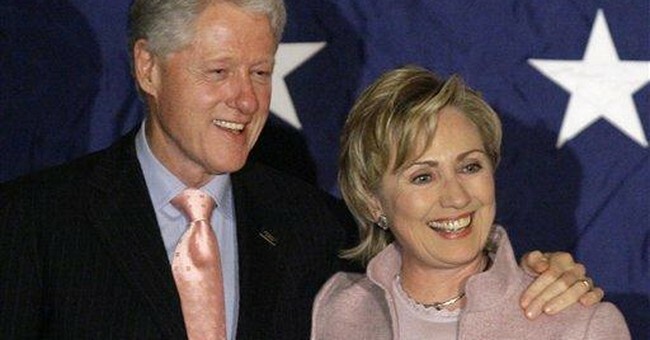 The Hill's report moves me to list seven issues every American should know about the Clintons before 2008. Journalists should be particularly interested, as well as Democrats intent on avoiding a repeat of the Clinton 1990s. 1. Every Clinton scandal of the 1990s had a precedent in the Clinton governorship of the 1980s in Arkansas. Just as the Clintons abused the presidential pardon power when they left the White House and took property that was not their own, so did they abuse the pardon power and pilfer from the governor's mansion upon leaving it in 1981. Just as they have been caught taking money from the shadowy Norman Hsu this year and from other dubious Asian figures in the 1990s, so too were their 1980s campaigns marked by financial irregularities. The first Asian donors entered their political lives in 1986, with the Chinese-Indonesian Riady family. In 2001, the Riadys paid more than $8 million in Federal Election Commission fines for their munificence in the 1990s. Hsu's donations are of a piece with what might be called the Clintons' "Chop Suey Connection." The Clintons dismiss all this as old news, but that is only because they are what law enforcement officials call repeat offenders. Even Hillary's health care fiasco of 1993-94 had a precedent in her statewide education reform in Arkansas that left Arkansas still at the bottom of the heap in national education ratings. 2. For years, the Clintons have bullied the press, political opponents, prosecutors and those women who caught Bill's eye. Their successful efforts to suppress the recent GQ story by Josh Green show that their bullying continues. Since the 1980s, the Clintons have employed private investigators, for instance, Terry Lenzner, Jack Palladino and Anthony Pellicano, the latter of whom is a convicted felon. Gennifer Flowers, Monica Lewinsky and Kathleen Willey are but the most famous of the many women who have been harassed by the Clintons' private detectives. In my recent book, "The Clinton Crack-Up," I report that at least one independent counsel in the 1990s took to carrying a gun after being harassed on Washington streets. The harassment was very similar to harassment my reporters experienced in Little Rock, Ark., in the mid-1990s. 3. Rumors of Sen. John McCain's temper have haunted his campaign. Hillary's temper is even more widely documented, by disaffected Secret Service agents, military aides, Arkansas state troopers and others. Hillary repeatedly has been in rows with agents whom she importuned to carry her bags despite Secret Service regulations against the practice. While first lady, Hillary threw a book at the back of an agent's head, as reported to me by White House military personnel. She repeatedly has thrown temper tantrums in front of staff, used foul language and hit her husband, as reported by security and other staff members. 4. Hillary is given to what the historian Richard Hofstadter termed "The Paranoid Style in American Politics." In 1998, she famously claimed that a "vast right-wing conspiracy" had mobilized against her and her husband. She repeatedly has characterized simple two-party partisanship as the consequence of secretive conspiratorial maneuverings. No modern politician so high in American politics has so frequently manifested the paranoid style, a style Hofstadter associated generally with political extremists, generally extremists on the far right. 5. The Clintons have, to use the words of President Harry Truman -- who, while president, scrupulously insulated the White House from fundraising and, in retirement, refused speaker's fees -- "commercialized the presidency." They used the White House, most notably the Lincoln Bedroom, to reward donors. Bill Clinton himself has earned more than $43 million in speaker's fees since leaving the White House, including millions from the Red Chinese and the United Arab Emirates. Such venality by a retired president is unprecedented, and his encroachments on campaign finance regulations have been numerous. 6. Very little of this has escaped the notice of journalists and of Democratic leaders. Yet after every scandal, they forget their public denunciations of the Clintons. Here are some flavorous reminders: After the Clintons and their siblings were caught in the 42nd president's last-minute pardon scandal, Jimmy Carter called them "disgraceful." Robert Reich opined that "Clinton is utterly disgraced." Al Hunt called Clinton the "albatross" of his party who should "drop dead." Al Gore's campaign manager, Donna Brazile, wrote in The New York Times, "It's time to let Bill Clinton go -- go on and live the rest of his life and allow a new generation of Democratic leaders to renew their fight on behalf of working families in America." New York Times columnist Bob Herbert affirmed that "Bill Clinton has been a disaster for the Democratic Party. Send him packing. … It's time for the Democratic Party to wise up. Ostracism would be a good first step. Bill Clinton should be cut completely loose. … Some of Mr. Clinton's closest associates and supporters are acknowledging what his enemies have argued for years -- the man is so thoroughly corrupt it is frightening." Editorially in February 2001, The New York Times asserted that "the former president … seemed to make a redoubled effort in the last moments of his presidency to plunge further and further beneath the already low expectations of his most cynical critics and most of his world-weary friends." And the newspaper lamented that it might "never understand the process by which a departing president and his wife come to put sofas and flatware ahead of the acute sense of propriety that ought to go with high office." The New York Observer assessed Hillary's election to the Senate "a terrible mistake," adding that "Hillary Rodham Clinton is unfit for elective office." Those are some of the unlovely things said about the Clintons by their friends . Now are the Democrats really going ahead with a Hillary nomination? 7. The media have been lax in reporting the Clintons' unprecedented record of ethical failings and outright corruption. Most glaringly even the conservative columnists remain inert. The conservatives have adopted the position that all of the above is passe and to dwell on it is unseemly and awkward. Well, call me unfashionable, but I find the Clinton record alarming.